Around seventy people attended the event at Heathrow Primary School, including seasoned anti expansion campaigners and local councillors amongst the residents who were looking for an update. The MP started the meeting and ran through the reasons why we should be opposing the new runway, backed up with a handout of copies of HACAN’s ’20 Frequently asked questions’. 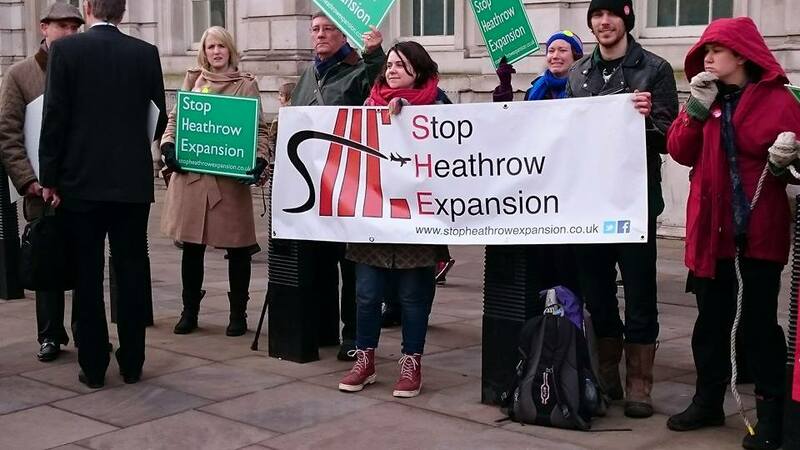 The familiar figure of ‘Stop Heathrow Expansion’ chairman Neil Keveren followed and pointed out that many such as himself had made life choices based around David Cameron’s promise that there would be no third runway during the general election campaign of 2010. The introduction was then followed by a Q&A session from the floor, with a number of valid points being raised. One gentleman, who I was to bump in to again the following week, brought up the state of the properties that Heathrow still owned from their last abortive bid to expand the airport – Managed by local estate agents Campsies, there has been little attempt to keep them in good order and they are starting to look shabby and run down. His own property suffers from blown plaster, leaky taps and damaged double glazing but efforts to get this fixed have been met with little co-operation. The consensus in the hall was that as little as possible is being spent to both maximise profits and to make the area look run down and therefore not such a loss if construction goes ahead. Likewise, Heathrow Airport Ltd are happy to let properties to transient workers via the agency which John McDonnell said breaks down the unique community spirit in some of the villages. It was suggested that if the runway is beaten again, these properties should be sold back in to the community in a similar way to which the then BAA sold back purchased properties when their expansion of Stansted was turned down. Council residents will be particularly hard hit if a Third Runway comes about – There will be no compensation for loss of their houses, with right to buy currently suspended in this part of the borough so that speculators can’t get their hands on property that they can then up-bid the Airport on. With lack of council property in the area, most would have to move away. 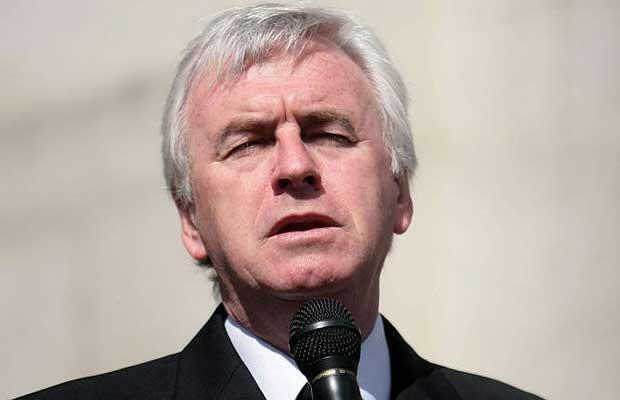 A gentleman from the back then asked John McDonnell where his party stands on Heathrow expansion, to which he received a reply of , “I don’t trust them”, then clarified with the follow up of, “I don’t trust any of them”. Whilst there is no doubt that Mr McDonnell is genuine in his opposition to Heathrow Expansion, he had already stated at a previous meeting that pressure needs to be brought to bear on the major parties in the UK to make them lay out their position on the issue. Whilst this was not a politically aligned meeting, the current positions laid out on the night showed that Labour will not give an answer on where they stand this side of the election, Lib-Dems look to be favouring Gatwick whilst only UKIP and the Green Party have made it clear that they are opposed to the Third Runway. 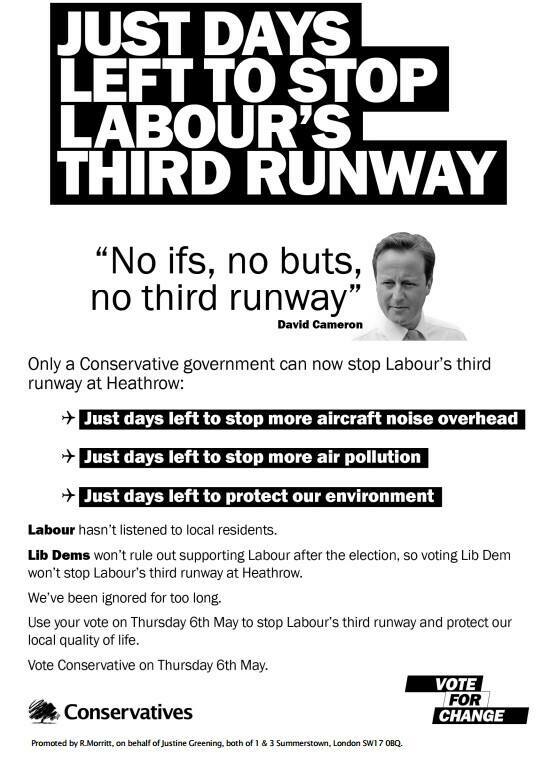 In 2010, David Cameron stated ‘No if’s, no buts, no third runway’ (See election leaflet below left)- A position that the Conservative Party are now shying away from, waiting until The Davies Commission gives its report in the Summer after the upcoming General Election. Indeed, Sir Howard Davies stated that he could have delivered the report before this election, but suspiciously it has been delayed. Again, this was brought up on the night and the opinion in the room seemed to be that the Conservatives are refusing to clarify where they stand for fear of it costing them votes, with the delayed report being a convenient shield to fudge behind. 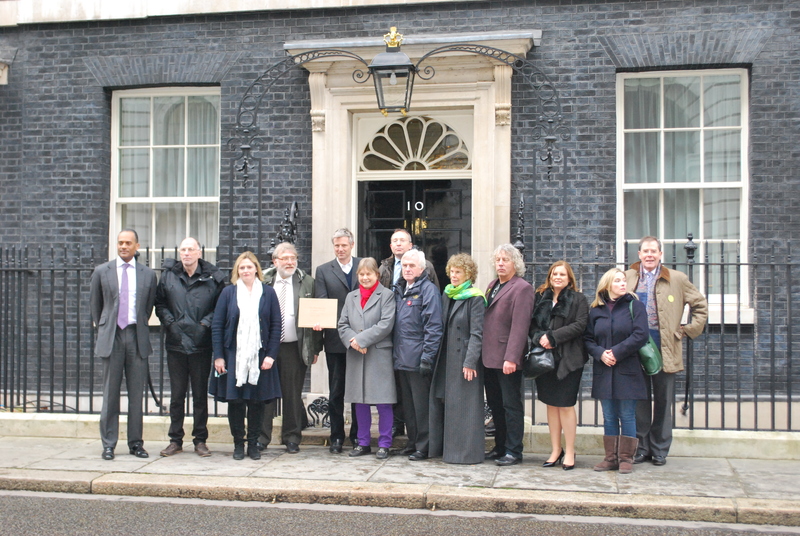 In order to remind The Prime Minister of his previous pledge, a demonstration was planned at Westminster to coincide with the end of the consultation on 3rd February where a petition was to be handed in at No 10 by a combination of MP’s, local campaigners and residents from across London. With freezing weather and a dusting of snow on the ground first thing in the morning, I contacted Neil at S.H.E to make sure that the coach that was being laid on from Harmondsworth was still leaving at the agreed time – Once confirmed, I took no chances and set off early to make sure the 222 Bus Route had not been affected. Arriving in the cold an hour early, I was happy to bump in to Neil who invited me in to his house for a cup of coffee with other activists whilst we awaited arrival of our transport. Here I saw proof of what he had said about people making lifestyle choices based on Cameron’s 2010 promise – His kitchen is midway through upgrade, whilst other recent work was in evidence. One of the activists joked that we should be campaigning to save Neil’s kitchen! The coach arrived fifteen minutes early, and around thirty people climbed on board for the trip to London. More activists were expected to meet us there from other parts of the Capital, as well as a number of MP’s and representatives of HACAN Clearskies and Plane Stupid. An uneventful trip saw us arriving outside the gates of Downing Street just before 1pm, where myself and SHE campaigner Albert were tasked with holding one of the banners whilst photographs were taken. (In picture below to the right, flat cap and brown trousers) We were pitched up opposite the statue of Viscount Montgomery of Alamein, but a Police motorcycle officer asked us to retire to the other side of the road where a demonstration area was set up in front of the statue. This we did, but not before the arrival of the first of the MP’s who were going to hand in the petition – Zac Goldsmith, John McDonnell, Mary McLeod and John Randall. John Stewart and Rob Barnstone from HACAN arrived around about the same time. 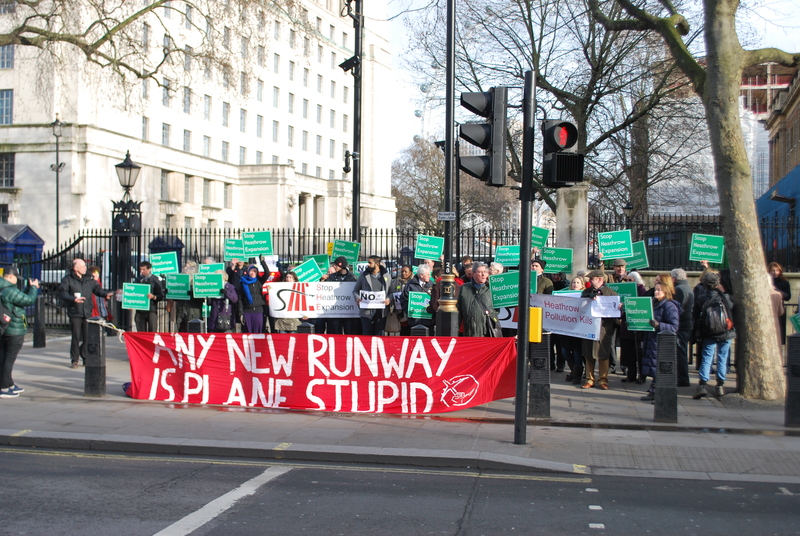 With national media descending, some ad hoc singing started, soon organised by campaigners and John Stewart in to a chant of ‘No If’s, No But’s, No Third Runway’. A gentleman I have seen before from Friends of the Earth paced around the group with his pipe and walking stick urging everyone to raise their voices. With the allotted time of 2PM for handing in of the petition fast approaching, the tall figure of Windsor MP Adam Afriyie joined us before making his way across the road and joining the group being ushered through the gates. 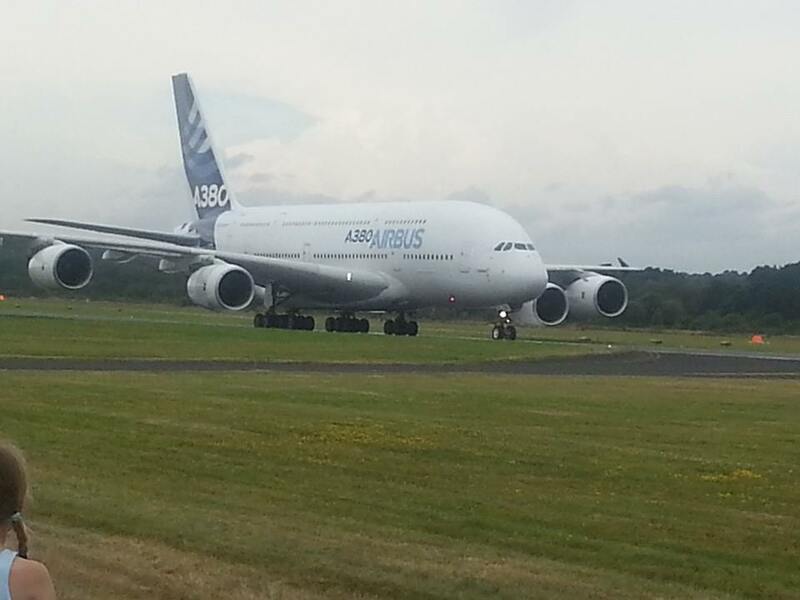 Out of the corner of my eye, I spotted Third Runway supporter Ed Balls MP scurrying past our position and challenged him with a shout of ‘oppose the third runway, Mr Balls!’ Whilst he didn’t look up, his pace seemed to quicken somewhat! Kate Hoey MP had also joined the group, although I failed to see her entrance or exit from the venue – The coach came back and picked us up for the return journey to Harmondsworth just after 2.30PM. Small and targeted demonstrations such as this defeated the spectre of the Third Runway the last time around. 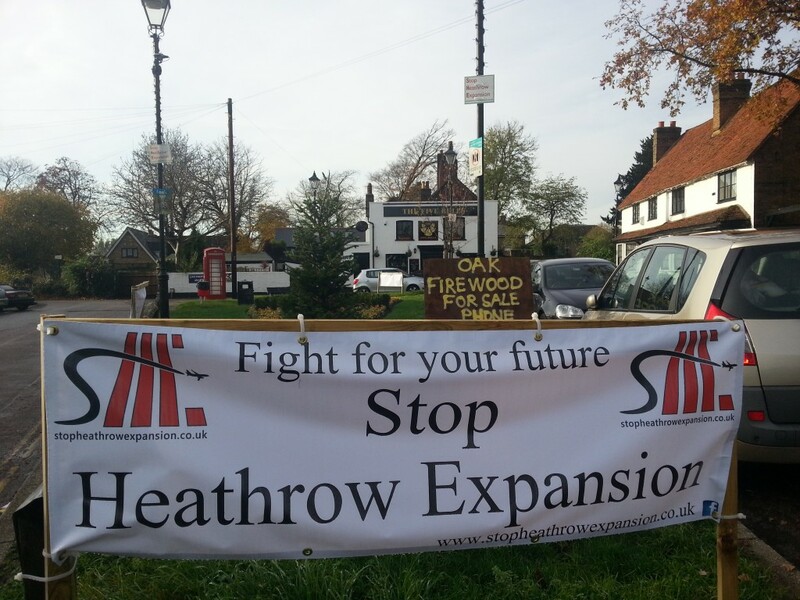 Despite the vast resources ranged against residents who are opposed to expansion by both Heathrow Airport Ltd and it’s lobbying front group, Back Heathrow, this is a battle that can be won again. In terms of Environmental Groups, both Greenpeace and Friends of the Earth are active against Heathrow expansion, whilst local organisation ‘Grow Heathrow’ have taken waste land in the vicinity of the airport and turned it in to a sustainable community. On the political side, UKIP are committed to opposing a Third Runway at Heathrow whilst keeping the airport open in its two runway format to protect local jobs. If you are against Heathrow Expansion but for local prosperity, then UKIP have a vision and policy in place for General Election 2015 – Voting for the old parties who refuse to tell you where they stand will continue the blight and uncertainty that affects the south of our borough. This entry was posted in Heathrow Third Runway, Housing, Local issues and tagged david cameron, Davies Commission, HACAN Clearskies, Heathrow, Heathrow Expansion, Heathrow Airport, John McDonnell, John McDonnell MP, John Stewart, Labour party, Neil Keveren, Stop Heathrow Expansion, UKIP.